Procrastination is not your friend. I am fairly well acquainted with it and I know there are very few occasions, if any, when it could be seen to be a positive. I remember years ago reading a fairly generic article where various woman shared their best one – liners of advice and the main one, well, the only one I remember is so simple, but for me, so perfect – ‘Just do it, then it’s done’. It just made me think, if I could just apply this to so many things in my life, I would surely be more productive and most likely less distracted. Like with all those little things that niggle at the back of your mind – phone this person, email someone else, fix this, buy that, do this, do that, go here etc etc Whatever it is, I’m pretty sure we all have them… don’t we?! I go through phases where I get better at applying this to my life. If I need to fix something or email someone, I try to do it straight away. It is amazing, if a tad pathetic, the relief and satisfaction I seem to feel after dealing with these small, but irritating things, that simply just need to be done. So, I am writing this for myself, as a reminder, as much as I am for anyone else that perhaps needs a little push. If you want to be more focused, productive, and generally achieve more in your day, week, month… tick off those little, but necessary things on your list first, get them out the way and then you will hopefully be more focused with less distractions at the back of your mind to get on with what you really want to be doing. This could, I suppose in it’s own way be seen as procrastination as I have read people advise that the best way to be productive is to tackle the hardest/ biggest thing on your to do list first, otherwise you just circle around it all day and find other things you could be doing first. Perhaps this is the best tactic, I’m sure different ways work for different people. 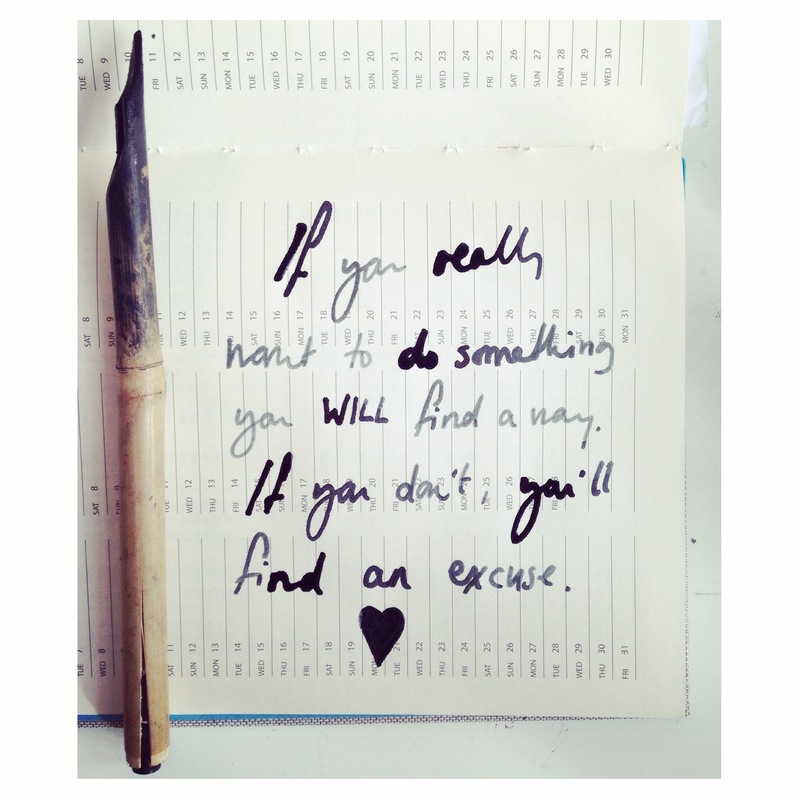 But the main advice in both is to start, take action… like, now! Continuing on this thread, after receiving another email earlier from someone asking how I came about a certain commission, or client or how I did this or that, it made me come back to something which really gets me excited and motivated and realise that it is something I want to do more of this year – I want to motivate you, I want to inspire you and I want to help more people see that they are not fulfilling their potential and that they are so much more capable of so many things if they only put their mind to it. The more I give out this sort of advice, the more I question it… perhaps I’m wrong and not everyone is capable of what I think, maybe I should be more careful when I tell people to quit the job they hate, and have done for years, to take to the road and travel with no particular aim but just because they had a strong urge to. Maybe not everyone is strong enough to deal with the aftermath, the struggle to then help your reality take shape. Or maybe not enough people have even tried? And that is why more people don’t. If you are surrounded by people who just accept things as the way they are, and think they have no choice in the matter, then it is less likely that you will question that in your own life. Without trying to waffle too much, once I get into this I could go on for a whiiiile, here are my main two points, I think. Ok, maybe not everything, but ‘question most things’ doesn’t quite have the same ring to it. All I mean is, if there is something in your life that you are not happy with, don’t just accept that there is no other option, feel sorry for yourself and continue with it. Question it. It really is my belief that most people have an option, everything in their life was and is a choice. Once you accept this, it gives you control back, it’s exciting! What would you change if you could? Well guess what, you can! I know some will think I have my head in the clouds, but the reason I am close to 100% sure of it now, is because I did it, I changed things I wanted to, and I try hard to keep changing things that I am not happy with now. Whatever it is you want to do, whether it be loose weight and get into shape, learn a new language or quit your job and do your creative thing full time/ freelance, you need to do more than think and talk about it. Obvious yes, but it is in our blood to talk the talk and so many people convince themselves that they mean it and will get around to going to the gym, or eating healthy, or looking for a new job, but it seems much rarer that people actually take action and do something about it. Which we have all done, and the reason is that it takes effort, and confidence and courage. But it feels amazing when you even take one small step towards it. My advice, is start with one small thing. What tiny step can you take towards your goal? Do it. Then figure out the next small step… you should congratulate yourself after each small step, because it is a lot more than thinking and talking about it. For example, if your goal is : to loose weight/ be healthier. Don’t be unrealistic, start with something achievable like, no snacks between meals. Or no snacks every day apart from Friday. Then maybe your next step could be to eat more veg every day. Then maybe your next small step – after you have kept up the previous two for a little while – could be to do 15 mins of exercise every day, or take the stairs instead of the lift (elevator) everyday, or do sit ups every other morning. Ok less about vegetables, but I hope you get my point, if you can apply that method to whatever it is that you want to do, it does make it seem more achievable and therefore you are more likely to stick to it longer than a week. This may be stating the obvious but actually I think sometimes when things are written down, or said out loud, they all of a sudden become so much clearer and therefore easier to put into action. I don’t believe that January is the only time to make changes and resolutions, but it is as good a time as any, so I hope this has helped some of you feel a little more motivated with your goals or resolutions! And thanks so much for the comment, glad you liked the post!